When a municipality requires traffic guard service, protection of people and property is the number one priority. Undoubtedly, a multi-faceted approach to ensure success. Equipment, strategies, and personnel must be up to the task and well-coordinated. Without this connection between all these traffic control components, both safety and service may be compromised… and often is. Roadway Construction Services understands the value of a multi-level approach. And to ensure we deliver in this area, we’ve developed our solutions to provide both breadth and performance in every situation. 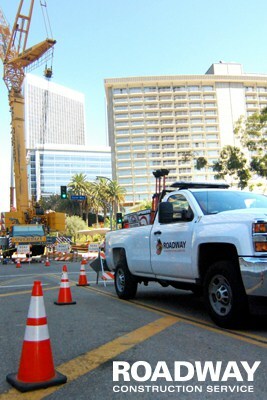 Whether a project is minor or major, our in-depth traffic guard service consistently achieves optimum results. Consider traffic flaggers. This group of experts represents one of the important components of our sophisticated traffic control system. Dedicated to their craft, they embody a variety of traits necessary to maximize road safety and efficient traffic flow. It all begins with training. Our traffic flaggers have received the best possible, earning in the process a variety of prestigious certifications. These include the highly-regarded certifications awarded by OSHA. These aren’t just handed out like free coffee at a sporting event. Prospective flaggers must participate in a rigorous educational program demanding both dedication and innate talent. Once these certifications are earned, the students are indisputable masters of their craft. Their skill and dedication in the field is a big reason for the success of our traffic control service. Does your project require encroachment permits? The acquisition of encroachment permits is another vital aspect of our operations. These authorizations are required whenever a project impacts a right of way area. Obtaining them, of course, is no easy matter. Our team must develop a suitable encroachment strategy. This requires thorough traffic control planning, a process that must consider a variety of variables. These include road conditions, lane closures, project scope, pedestrian and vehicular traffic, geographical layout, and possible hazards. When is an encroachment permit be needed? These authorizations are applicable to a variety of situations. For instance, right of way issues may arise during the staging of special events. These issue also are very common for construction projects, or any number of situations calling for temporary traffic control. The securing of encroachment permits also benefits from having important connections. Fortunately, our team has long-standing relationships with many municipal officials and other decision-makers. Through years of productive interaction, we know their expectations and understand their concerns. Because of this solid connection, Roadway Construction Service consistently has all the pieces in place well ahead of time. This preparedness reduces the time needed to secure encroachment permits, ultimately saving clients considerable sums. Would you like to learn more about utilizing our traffic guard service for a project or special event? Reach out to Roadway Construction Service any time. We’ll be happy to provide additional information and answers to all your questions.